Onion botrytis leaf blight, often known as “blast,” is a common fungal disease that afflicts onions grown around the world. The disease spreads rapidly, significantly affecting quality and yield when harvest time rolls around. Below, we have provided helpful information on onion botrytis leaf blight prevention and its control. Onions with botrytis leaf blight display whitish lesions on the leaves, usually surrounded by silver or greenish-white halos. The centers of the lesions may turn yellow and take on a sunken, water-soaked appearance. Botrytis leaf blight on onions is most common on older leaves. Botrytis leaf blight on onions is most likely to develop as a result of heavy rainfall, extended periods of relatively cool, damp weather, or overwatering. The longer leaves remain wet, the more severe the outbreak. When foliage remains wet for at least 24 hours, the risk of developing botrytis leaf blight is high. Although it is less likely, the disease can occur when leaves are wet for only seven hours. Temperature is also a factor. Onions are most susceptible when temperatures are between 59 and 78 F. (15-25 C.). The disease takes longer to develop when temperatures are cooler or warmer. Unfortunately, no onions currently on the market are resistant to botrytis leaf blight. However, there are steps you can take to prevent or slow the disease from spreading. Plant onions in well-drained soil. Soggy soil promotes fungal disease and rot. If possible, avoid overhead irrigation and water at the base of the plant. Water early in the day so the foliage has time to dry before temperatures drop in evening, especially if you use a sprinkler. Limit irrigation late in the season when onion tops are drying. Don’t fertilize late in the season either. 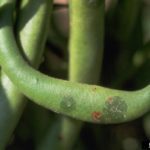 Fungicides may slow spread of onion botrytis leaf blight if applied at the first sign of disease, or when weather conditions indicate the disease is imminent. Repeat every seven to 10 days. Keep weeds under control, especially wild onions and other alliums. Rake the area and destroy plant debris after harvest. Practice crop rotation of at least three years, with no onions, garlic, or other allium planted in that soil during the “off” years.